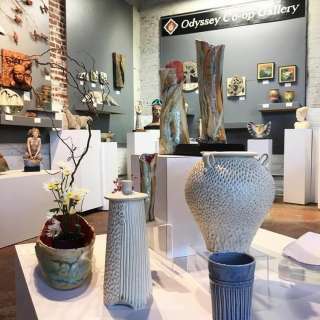 Odyssey Cooperative Art Gallery features 25 local ceramic artists working in a variety of styles including functional and non-functional pottery and works of figurative and abstract sculpture. We are open Tuesday through Sunday from 11 AM to 5 PM in the heart of the River Arts District, 238 Clingman Ave. Check out our Website Odysseycoopgallery.com or see us on Facebook at facebook.com/odysseycoopgallery. Contact us by email at odysseycoopgallery@gmail.com or call 828-285-9700.